You can now grow deliciously sweet peaches here in the UK! 'Red Haven' is an August fruiting variety with lusciously sweet yellow flesh that melts in your mouth when you bite in to it. Self-Fertile, like the majority of our fruit varieties, so will crop reliably for you and needs no other tree to make fruit. 'Red Haven' also makes a lovely potted specimen for your patio, which will allow you to position it favourably when necessary. 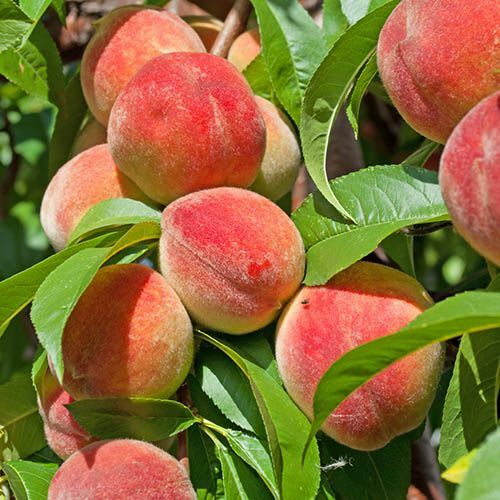 You can now grow deliciously sweet peaches here in the UK! 'Redhaven' is an August fruiting variety with lusciously sweet yellow flesh that melts in your mouth when you bite in to it. Its Self-Fertile, like the majority of our fruit varieties, so will crop reliably for you and needs no other tree to make fruit. The gorgeous, sweetly fragrant pink blossom looks a picture in springtime, but ideally needs a little protection from late frosts initially plant your tree against a south facing wall and cover with fleece when in flower in the spring - this is not to protect the tree itself, which is totally winter hardy, but to give the blossom maximum protection so it has the best chance of full pollination. The warmer the position of your tree when its in blossom, the busier the bees and other pollinating insects will be making you lovely peaches! 'Red Haven' also makes a lovely potted specimen for your patio, which will allow you to position it favourably when necessary. You can then really make the most of the fragrant spring blossom and perfect summer fruits.